We all love Rava Dosas, Don't we? Till about a few years back, I used to think that Rava Dosas taste the best only in restaurants. But my idea changed when I was pregnant with my little one. I suddenly woke up at midnight and had a craving for Rava Dosa. S was so sleepy but I dragged him to the kitchen to give me company while I search for the recipe online and make rava dosas too. (Must have seen his expression!!). So long story short, I successfully made rava dosa at the thick of night and forced S also to enjoy them! Strange are the cravings of a pregnant woman, don't you think? When I saw this entry in the 'Kid's Delight - Restaurant Recreation' event happening at Versatile Kitchen (thanks to Srivalli), I thought this is something which all of us at home would enjoy. So I volunteered to try this recipe courtesy - PJ. Rava Dosa reminded me of this incident and it surely made a great breakfast for all of us over the weekend. I pretty much followed the original recipe barring a few changes to suit our family requirements. The idea was to make it kid friendly and so no spices :) (But I shall put down the recipe here for my future reference) Here is how all 4 of us enjoyed..
By the way, these days my 9 year old is feeling very pampered and surprised as I am making too many things which she loves and getting the feedback also from her!! In a bowl combine roasted sooji, rice flour, maida , salt and mix well. Whisk curds/yogurt and add to the above mixture. Mix in pepper and cumin seeds. Let the batter rest for 10 minutes. The batter would be a little stiff now and so add 1 1/2 cups of water and stir well to get a watery consistency. Heat a griddle/Tawa. Pour a ladle full of batter in a circle from the edge to the center. Do not spread the batter with the ladle and do not fill the small gaps. Better still, sprinkle the batter to get a thin rava Dosa. Drizzle a little oil around the edges. (I used very little oil by just spraying oil ). I added chopped onions now and pressed with a ladle so they don't fall off. (The usage of onions is optional). Gently flip it over and cook for about a couple of minutes. Fold into a semi circle / triangle and serve hot with a side dish of your choice. Continue for the rest of the batter. There were a few bread slices in my pantry that were almost forgotten. They grabbed my attention when I was planning to make some snack for my daughters. Thats how this Bread Uthappam happened in our kitchen. These uthappams which both my kids loved is such a simple recipe and so easy to come up with. I reduced the spice levels for them and that surely made a difference for them. Please feel free to alter the spices as per your taste. Chop the bread slices into 1 inch bits and soak them in 2 cups of curds/yogurt. After about 2-3 min mash the bread slices or blend them into a coarse paste. (I used my hand blender). On a hot tawa/griddle pour ladle full of batter and spread it in a circular fashion (slightly thick) and spray oil if required and cook on both sides. Serve with chutney, ketchup of your choice. Sending this Bread Uthappam to Pari's 'Only-Cooking With Bread'. 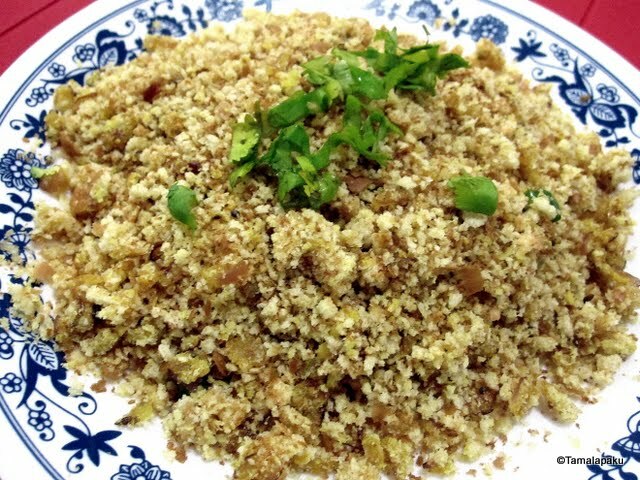 Bread Upma to the above event. I first was introduced to Chestnuts by a stranger at a local farmer's market about 5 years ago. I was checking to see what these amazing nuts were when a gentleman came up to me and gave me tips on how to choose these nuts and also how to cook/eat these. Since then I get these nuts home whenever I spot them in the market. Later on I read up on the nutritive value of these nuts from here. It is so easy to roast and also is a very filling snack. So next time you spot it in the supermarket, don't ignore these delicious nuts! Use a sharp knife to cut an X into one side of each chestnut, or prick chestnuts with a fork to allow steam to escape. Arrange the chestnuts on a microwave safe plate (in a single layer - about 8-10) with the cut sides up. In 1 minute intervals, nuke them for about 3 min. (The first batch was done in 4 min and the subsequent batches took 3 min). They are done when they can be easily peeled. Peel the nuts when they are cool enough to handle, and enjoy. My 9-year old loves samosas. But unfortunately she can't enjoy the ones which are store bought because she can't tolerate the heat and spice. Mildly spiced ones are not available anywhere neither can they be customized, so I took on myself to do that job for her! I absolutely surprised her by making these yummy samosas to suit her taste and she gobbled up a lion's share to my delight! There were hardly any remaining for me in the end but thats okay I guess. Even S was impressed and complimented me (albeit in hushed tones) saying that they were better than the ones from the restaurant/store!! That reminds me that these samosas should be on their way to 'Kid's Delight - Restaurant Recreation' happening at Versatile Kitchen initiated by Srivalli. There are umpteen recipes on the net about this recipe and here is my take on it. In a mixing bowl, add maida, sooji, salt and ajwain. Mix well and rub in the ghee/oil so that it is well incorporated. Add warm water and knead into a stiff dough (like chapati dough). I would like to cling wrap the dough and set aside for 15-20 min. (Or just cover the dough so it doesn't dry up). Meanwhile, lets prepare the filling.. In another bowl, add the chopped and boiled vegetables add all the other ingredients except the seasoning and lemon juice. In a heated sauce pan, add oil and the rest of the seasoning. After the mustard seeds splutter, add the vegetable mixture and cook until the mixture is dry. Remove from fire and squeeze in some lemon juice and mix well. Pinch a gooseberry sized dough and roll out thin circles. With a sharp knife, Cut the circle into equal halves. On each half, apply water and make a cone/triangle shape and press well so that the edges are sealed properly. Fill in about a tablespoon of the vegetable filling and seal the edges by applying water. Once when I was blog hopping, I came across a flour called Rajgira flour. I hadn't heard of that until then. Curious as I am, I looked over the internet and found that it is Amaranth flour. I have seen Amaranth seeds in many ethnic stores around here but never knew much about it. I was amazed at the nutritive value of this flour (good source of Iron and Calcium). So I got the flour and adapted the recipe from here to make these rotis. These rotis were amazingly soft. It was surely different from the regular wheat flour roti in texture but delicious, nonetheless. In a mixing bowl, add the flour and mix in the mashed potatoes. Add salt, coriander leaves, chilli powder and jeera powder in the flour. Make a firm dough adding water if required. Make equal portions of the dough and roll each of them softly like a chapati. Since rajgira flour doesn't have gluten, it will stick to the rolling pin. Generously use flour for dusting. (I used wheat flour for dusting). Heat a non stick pan, cook on both the sides adding oil/ghee as required like regular chapatis. Serve these rotis with any curry/sabji of your choice. This is not the typical cilantro chutney we make regularly at home. I was very much interested in this when I first heard it from my friend, Vijayalakshmi. According to her, this stays fresh for more than a few months if proper care is taken to keep moisture away from the pickle. She also says it is a boon for people who miss the traditional Gongura pachadi (Sorrel leaves). That tempted me the most!! So I immediately got the cilantro and started to work on it. It was a very interesting blend of flavors and we surely loved it. Trust me, this recipe is a keeper. Thanks to Vijayalakshmi, we are enjoying this yummy pickle . Wash the cilantro well and chop them into 1 inch in size. (Just discard the roots and let the stalks remain). Air dry the chopped kothimeera on a kitchen towel for a few hours. (I left it overnight). This is to ensure that there is minimal moisture in the cilantro. In a wok/kadai, add 2 Tbsp of oil and on low to moderate heat, fry the kothimeera stirring constantly until it is just about tender but not mushy. Take care not to let moisture set it. Remove from fire and set aside to cool. Meanwhile, dry roast the methi seeds, sesame seeds and warm the mustard seeds. Powder them upon cooling. (If using dry red chillies, now is the time to roast them and powder them too). Add the above powders to the warm kothimeera. Add salt, mirchi powder and turmeric as well. Pulse the mixture to desired consistency. I made it a semi-coarse paste. (Remember -No addition of water). Prepare the seasoning - In a sauce pan add oil and the rest of the seasoning. After the mustard seeds splutter, add the seasoning to the cilantro mixture. Mix well and the pickle is ready to be enjoyed. It is better consumed after a few hours so that all the flavors have enough time to blend in! A few weeks back, I had to attend a potluck party and I volunteered to prepare a sweet. What better an opportunity can there be to satisfy my sweet tooth and also derive the satisfaction of having prepared a delicious sweet. Both my hands and tongue are happy :). This way I get to share the sweets with my friends, socialize and consume a minimal portion ! Three-way win!! I found this recipe at VeggiePlatter and decided to give it a shot. For the first trial I made a small batch of these puris with jaggery syrup. They came out nice but on second thoughts prepared more with sugar syrup as in the original recipe for the potluck party. It was liked by everyone..Come on, whats not to like in a puri dipped in sugar syrup and garnished with almonds and coconut? So try it and see for yourself. In a mixing bowl, add flour, saffron and ghee and mix well to form a crumble like mixture. Add water gradually to make a soft dough like Puri dough. Knead for about 3-4 min, cover and set aside. Meanwhile, make sugar syrup by boiling 3/4 cup of sugar and the same amount of water. Let the water get a little sticky. Add cardamom powder and remove from the flame. Divide the dough into equal portions and roll out thin discs. Fold the each disc into a triangle (fold the disc into a semi circle and then into a quarter of a circle to form almost a triangle) and roll out again to keep the triangle shape and keep the layers together. Use some flour if the dough gets sticky and unmanageable. Continue making the triangles with the rest of the dough and keep them covered until ready to fry. Heat oil in a wok/kadai and check for the right temperature to drop the triangle puris in. When a small sample dough is dropped in the oil, it should immediately rise to the top. Fry all the puris until they are golden brown and drain them onto paper towels to absorb extra oil. Soak these puris in the sugar syrup for about a minute and arrange them on a serving plate. Chop almonds and sprinkle them on the syrupy puris and garnish with coconut ! Surely going to link it to Aipi and Priya Mitharwal's weekly 'Bookmarked Event'. My 9 year old has been asking me for these chocolate chip cookies for a long time now. I have been postponing both buying these cookies and baking them myself. In fact I had everything needed to bake these cookies for a long time now. Finally, the 'Kid's delight-Restaurant Recreation' event announcement was what I needed to bake these cuties! Thanks to Champa and Srivalli that these cookies got baked in my kitchen! My Family Verdict - Bake again in a larger batch! In a bowl, whip together sugar and butter until they are creamy and fluffy. Add vanilla and honey and mix. Also add the flour, soda and salt. Mix well to form a soft dough. Fold in the chocolate chips. Preheat the oven at 350 F .
Pinch a small lime sized portion of the dough and press between your palms to make discs about 1 1/2 inch in diameter (Or whatever size suits you). Cool them on the baking sheet for about 5 min and then transfer them to a cooling rack. Watch them disappear in a day just as mine did..
Sending these cookies to Kid's delight (Restaurant recreation) guest hosted by Versatile Kitchen and started by Srivalli. Thotakoora Perugupachadi is yet another gem from my MIL's kitchen. This is something I ate for the first time after my wedding. And believe me, I fell in love with this perugupachadi/ yogurt sauce right from the get-go! The spicy taste of mustard and the creamy coconut marry perfectly in this delectable and healthy sauce. I follow this recipe to the T as narrated by my MIL and I am sure she would love it too! Here is the recipe and three cheers to my MIL!! Wash, chop and boil the Amaranth/Thotakoora leaves. Squeeze out any extra water. Its ok if it is moist but not too much water. Make a paste of green chillies, mustard seeds and coconut. (I would first make a powder of mustard seeds and then add in chillies and coconut!) Add thotakoora and give it a quick mix in the blender. Add salt, sugar, turmeric and adjust the taste adding as much yogurt/curds as needed. Finally, in a separate sauce pan, add oil and the rest of the seasoning and remove from the flame as soon as the mustard seeds pop and the dals brown. Add this seasoning to the thotakoora-curd mixture and enjoy with rice/roti! I first ate this Stuffed Bhendi at a friend's place about 7-8 years back. But somehow never got to make it at home. When we went to the market to get the usual veggies, S challenged me to make something interesting with bhendi as all the regular stuff with okra was getting boring. So I googled to look for varieties which can be made using okra. In many places I saw the recipe for stuffed bhendi which reminded me of the recipe which I had noted down from my friend. So these stuffed bhendi appeared on our dining table as a pleasant surprise! My kids also liked it as it was mildly spiced. I thought they could be served as appetizers too! We loved to pop them as is but they were better to eat as an accompaniment to dal and rice. Wash, wipe and chop off the ends of bhendi/okra and set aside. Grind coriander and cumin to a fine powder or use store bought dhania and jeera powders. In a bowl, add dhania powder, jeera powder, mirchi powder, amchur powder, salt, turmeric, hing and mix them well. Now make vertical slits in all the bhendis. Take care not to completely cut the bhendi. Leave about one centimeter on either ends when making slits. In each of the slits, carefully spoon the masala and set aside. In a heated wok/kadai add 2 tsp of oil and saute the finely chopped onions. Transfer the sauteed onions onto a bowl. In the same kadai, add 2 tsp of oil and saute gently arrange the okras. Fry them until they are slightly crispy. Keep stirring them carefully so that they get cooked evenly. It should be done in anywhere between 15 - 20 min. Remove from flame and serve as an accompaniment to rice and dal. My kids love Blueberries, Blueberry Yogurt, Blueberry Muffins and anything which has blueberries. So I always end up getting these muffins from the grocery store. I have also been looking all over the internet for an eggless version. Thats when I bumped into this recipe and was pretty impressed by the texture depicted in the picture. I made very small changes like reducing the butter and increasing the milk. Special mention - My little one helped me assemble all the ingredients on the kitchen table which was the activity center for us!! My older one did the rest of mixing and pouring jobs! In a mixing bowl, add all the dry ingredients and whisk well. [All the ingredients were measured by the kids under my watchful eye]. Mix the wet and dry ingredients until combined well. My older one loved to lend some hand here! Gently fold in the blueberries into the batter. Line the muffin plate with paper cups. This is the most loved job by the kids. With an ice cream scoop, divide the batter equally into the muffin cups. Bake for about 35 - 40 min or until a toothpick inserted comes out clean. Disclaimer - Please be prepared to clean up lot of messes!! 2. 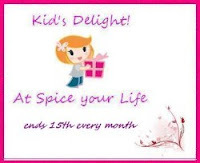 Kid's delight (Restaurant recreation) started by Srivalli . Rasam/ Charu is a compulsory item back home, both in my parents' and in-laws' places. Until a few years back it used to be unavoidable for me too. Of late, lot of changes in eating habits has forced me to get out of this habit but I do make Rasam occasionally. When there is Rasam at the table, we definitely enjoy more so in winter! This recipe is a typical preparation at my in-law's place. The rasam powder is my MIL's specialty. To this day, the taste of rasam my MIL makes is by far the best! Boil Tomatoes in about a cup of water and set aside. There are two ways of proceeding next. 1. De-skin the tomatoes and grind the tomatoes. 2. Grind the tomatoes and leaving some as is. Here, if desired, boil toor dal with water and blend and use it to partly substitute water. Add about 4-5 cups of water and turmeric, salt, rasam powder, sugar/jaggery, tamarind juice and bring the rasam to a boil.